Developing a product or changing procedures? 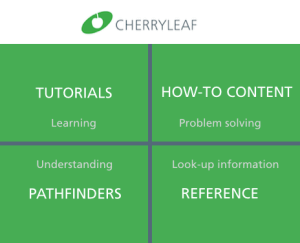 Discover how Cherryleaf can help you deliver the right help for your audience, simply and efficiently. The size and complexity of your product has an impact on what you need. Let’s start by working that out. Cherryleaf’s technical communicators focus on writing content that enables your customers to solve problems for themselves. Your users can get on with their jobs, you can have more time to work on what you’re good at, and your support staff can feel less overwhelmed. Having us write your Help content is a great way to reduce your team’s workload and let them to focus on what they do best. You get the right content for your audience, simply and efficiently. You can build confidence that your product is both usable and useful. This information can bring prospective customers to your website, too. That’s because many people search the web for information on how to solve their problems. We all learn how to write essays and reports at school, but few of us are taught how to write instructional content. By this, we mean online Help, business procedures, or training courseware. You need to be able to understand what the readers need. You need be able to write clearly – this is really important. You need to get the information itself. You also need to deliver on time. When developers have to write for end users, they have to deal with the “curse of knowledge”. This means when we know something, we find it hard to imagine what it was like not to know it. On top of all that, you might also need to know how to use the specialist software tools that makes it possible to manage and publish large amounts of content. The good news is that you can call on people who do have these skills. People like the ones who work at Cherryleaf. Don’t worry if you don’t have the time or skills to do it in-house. You can use Cherryleaf to create: end user documentation, embedded Help, UI/UX content (app UI text, text overlays, UI text, User Interface text), getting started guides, onboarding screens, Knowledge Bases, product datasheets, quick reference guides, reference manuals, tutorials, screencasts and video walkthroughs, and white papers. We have experience of working with companies both big and small. We’ll create and write these for you, simply and efficiently, and within an agreed schedule and budget. This means you’ll keep your software project and costs on track. It can be hard to find the time to document your APIs. With your developers used to focusing on details, this can also lead to documentation that lacks the big picture perspective. The answer is to have a Cherryleaf API documentation writer on your team. Having Cherryleaf’s technical communicators write your API documentation is a great way to free up your developers’ time. As a result, they can focus on what they do best. We can provide you with a technical communicator skilled in writing API documentation. They can work on or off site, depending on your preference. We’ll provide you with content that is easy for staff to understand. Cherryleaf writes and updates policies and procedures. If you need to develop web pages, white papers, and other types of technical copywriting, Cherryleaf can help you. We write compelling content your prospects will see as credible, clear and trustworthy. For examples of what we do, see our case studies. Cherryleaf is one of the best technical authoring houses in the business, and profoundly knowledgeable, professional and approachable. Highly recommended for anyone requiring top-notch documentation or training services. Some documentation projects are best done collaboratively. We become part of your development process. We can work in a way that you’re able to add content. For example, your subject matter experts can write a rough draft for a topic. We can then turn that into clear information. Cherryleaf's projects team establishes long term relationships with many of our customers. We can also provide training, so you have the skills to maintain the project in-house. If you want to recruit someone on a permanent basis, Cherryleaf can help with that as well.